I am very full. I write this almost immediately after eating Sunday night dinner, a meal one shouldn’t miss. Tonight we had beef short rib, slow cooked for 9 hours with red wine, mushrooms, carrots and smoky bacon. The rib was tender and left the clean, sleek bones behind in the slow cooker. We had mashed potatoes made smooth with a hunk of butter and big scoop of chicken stock from a roast during the week. On the side, softened leeks. 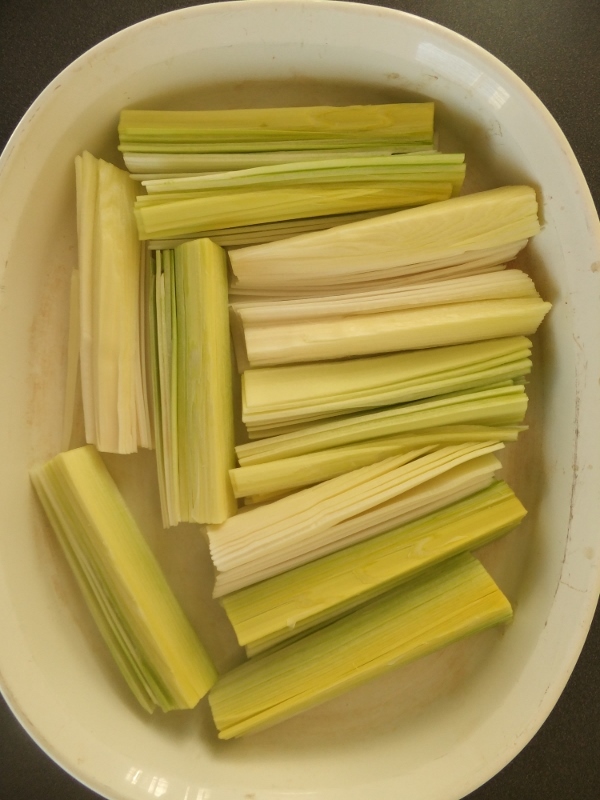 I watched the leeks slowly steam in butter and oil through the glass lid of a fry pan and the light green colour, like a perfectly ripe avocado, reminded me of a very good leek recipe I have been meaning to share. The leek is probably my favourite vegetable. A strong declaration perhaps when you consider the variety, the sheer abundance and colour of the vegetable world. But the sleek, white, sturdy and soil-dusted trunk with the green fan tops are my most loved. 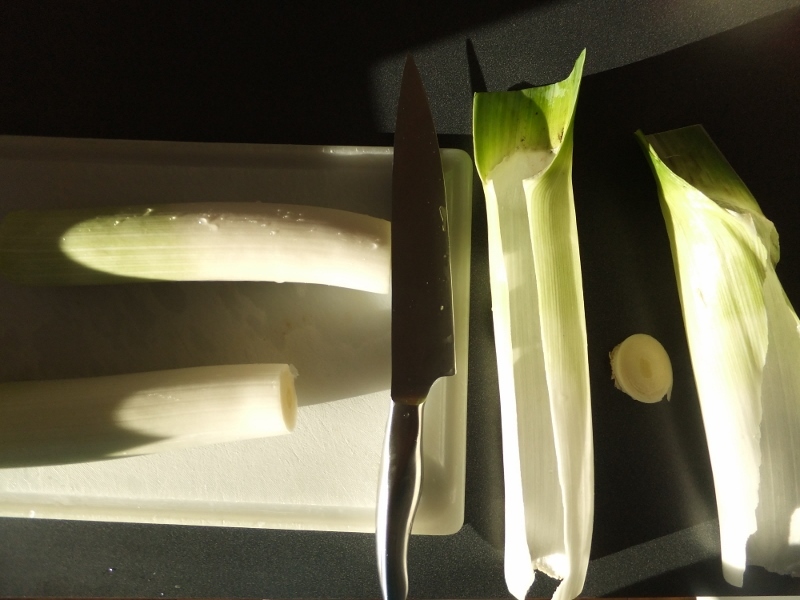 I cannot pinpoint when the leek became a crucial part of my culinary arsenal, which is likely another measure of favouritism – never a conscious decision but a slow integration until you cannot remember ever cooking without it. I realised I began most meals by dicing a piece of a leek rather than an onion or like the meal tonight, sauteed leeks became as common as steamed broccoli or green beans for the vegetable side. 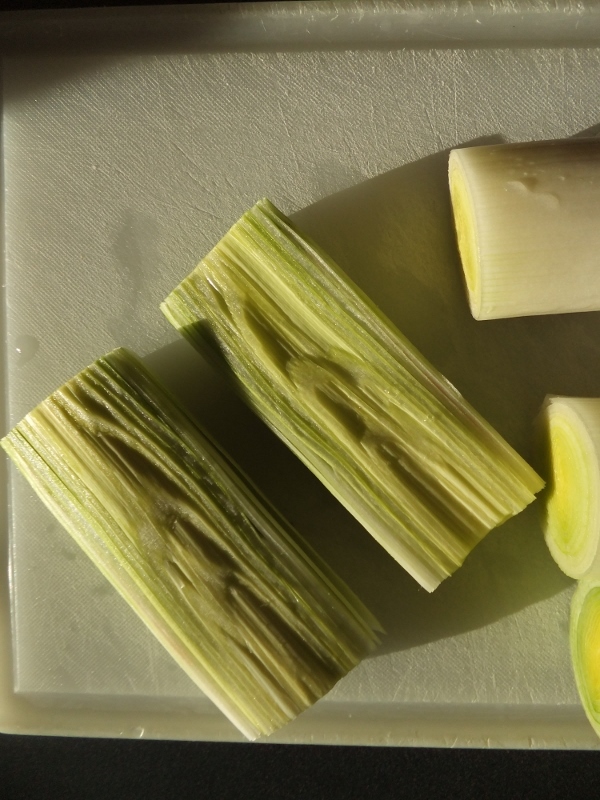 Then much like broccoli once made the leap from a humble side to the star of the show (think roast broccoli), leeks began to do the same. These leeks do indeed steal the show. They are acidic, bright and sweet. 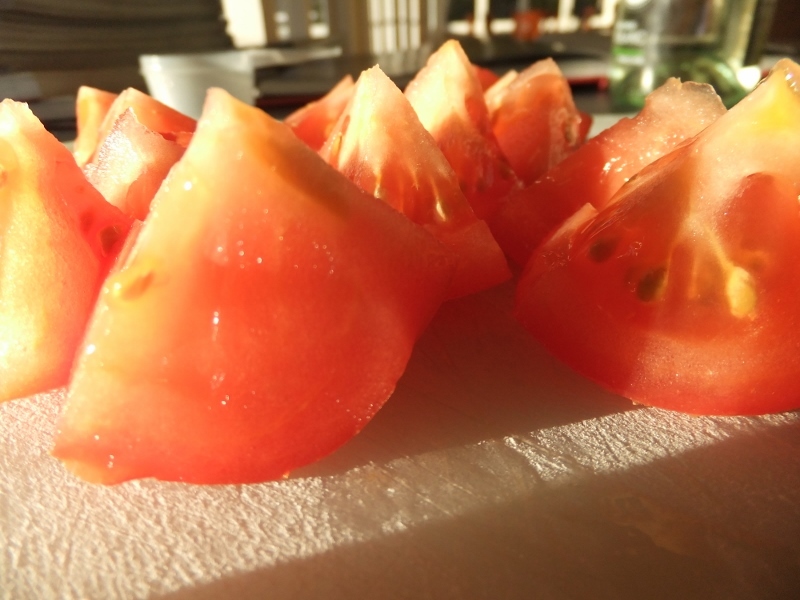 They are like ribbons, almost pasta in texture; wide wraps of tender noodle. 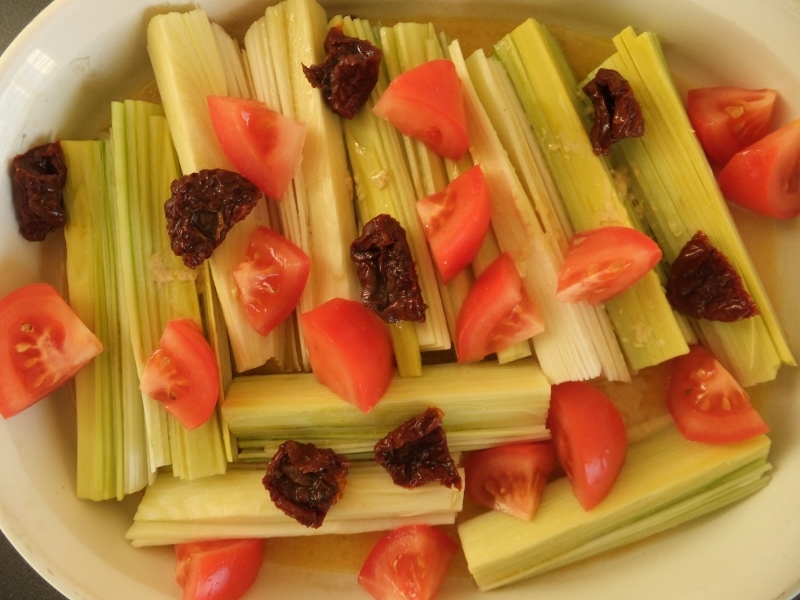 With tomatoes and a robust mustard vinaigrette, they seem an entirely different vegetable to the diced and sauteed and the gently cooked leek for soup. I’ll let the photos do the talking here. 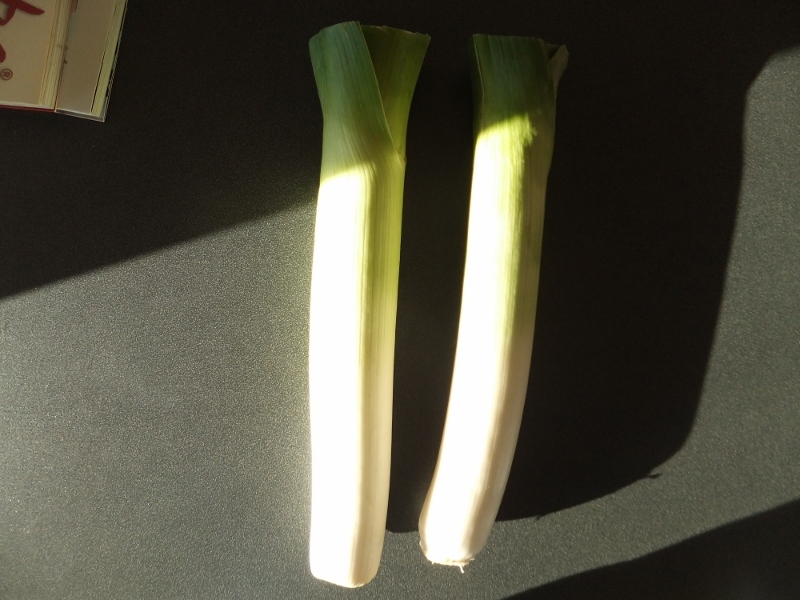 It’s late on a Sunday and between the title and the photography clues, I’m sure you get the idea – that there is perhaps more to the leek than we thought. This serves as a generous accompanying dish for four people. Goes superbly with chicken, but also with pork chops. Pre-heat oven to 180°C. 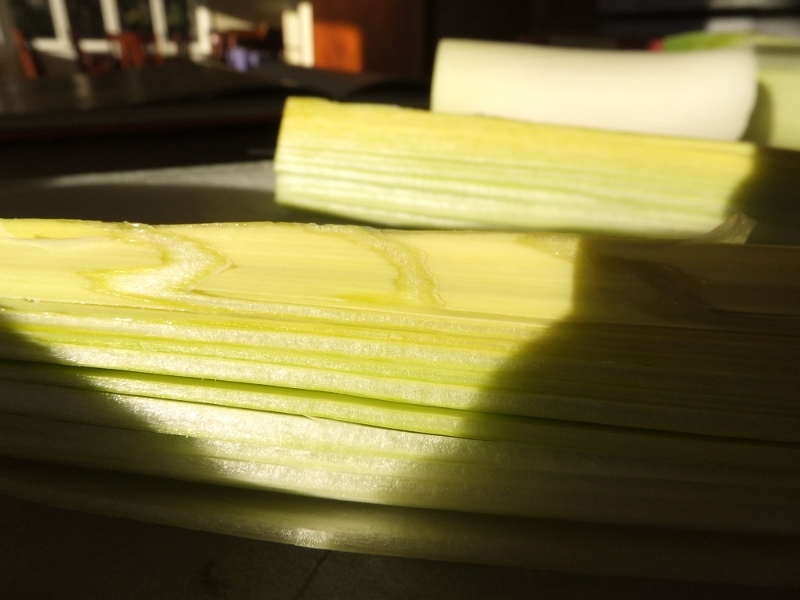 Cut the white of the leeks in half lengthwise then each length into quarters, lengthwise. 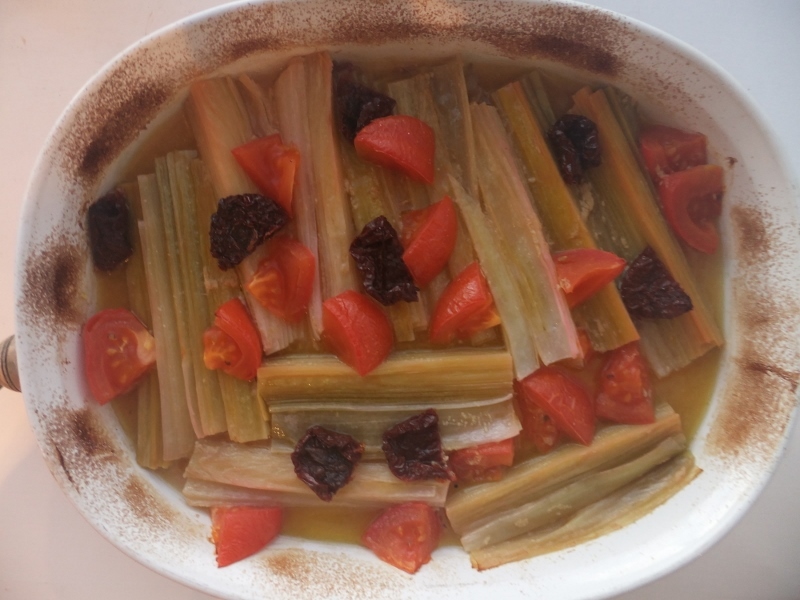 Place the leeks into a large oven dish with the chopped tomatoes or sun-dried tomatoes. In a bowl or jug mix the vinaigrette ingredients together and pour over the leeks. Cover with tin foil and bake for 20 minutes until tender. Remove from the oven and remove the tinfoil then gently mix, basting the leeks with the sauce. Place back in the oven with the tinfoil removed for another 15-20 minutes until soft and floppy.